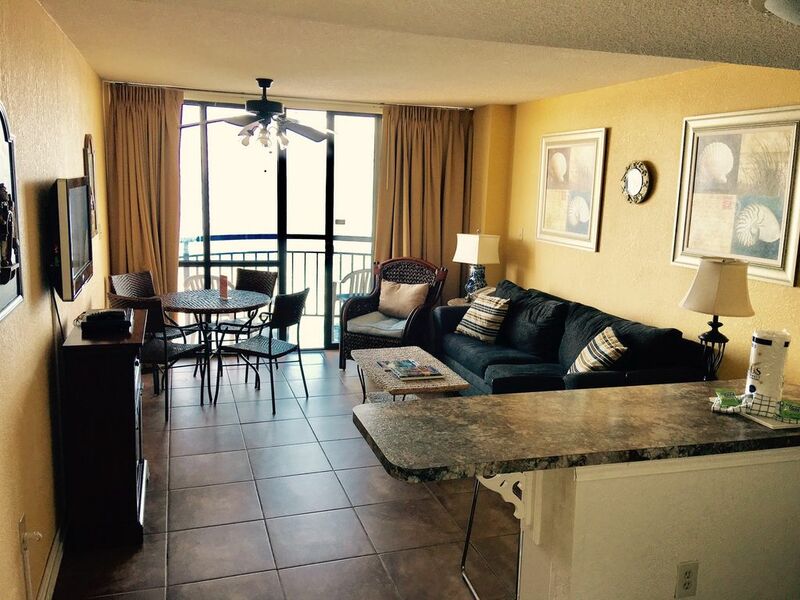 This beautiful oceanfront suite is located just north of downtown Myrtle Beach, South Carolina. Located on the twelfth floor (1202) of the resort. It is tastefully decorated and has a front-row view of the Atlantic Ocean. Located 1 mile from the Convention Center and Myrtle Beach Sports Complex. This unit is best for a single guest, couples or a couple with a child. The walk thru bedroom has a comfy pillow top king bed. The hallway leads to the living room/kitchen and finally to the breathtaking balcony overlooking the water. The living room has a new queen fold-out couch and an electric fireplace. Sit on the spacious balcony all day and enjoy Myrtle Beach's beautiful sandy beach as the sun reflects off of the water or you can watch the sunrise as you enjoy your coffee in the comfort of the living room. The kitchen/living area features all of the amenities required to cook full meals and allow you to dine in the comfort and privacy of your unit. The building has both indoor and outdoor pools and hot tubs. Enjoy any of the on-site amenities or take part in the exciting vacation opportunities available close by. If you enjoy golf or the shopping/dining/nightlife of Broadway at the Beach this unit is centrally located at an affordable price. Please email to book this unit today so that you do not miss out on your preferred dates. Please note that the Meridian Plaza is a completely NON-SMOKING building including balconies and common areas. If this is an inconvenience to you, please consider another property. No pets other than registered service animal are allowed. We are pleased to offer free wireless internet at this property. At least 1 guest in the party must be 25 or over. The building has a full vending area with laundry facilities. We have 2 units in this building if your accommodations require more space. See listing #304196. Thank you for visiting our listing. I am an owner of an insurance agency in Charlotte, NC. I have also have served as a deputy sheriff for over 20 years. We are always making improvement for us and our guests. Location is close to everything. Walking distance to many restaurants, the boardwalk, Broadway at the Beach. Parking deck across the boulevard with one space available for the unit. Everything was exactly as described. Great view and will definitely recommend this condo to others. Can't wait to come back. Thanks again for staying with us Renee. We look forward to having you stay again! Everything was perfect! We had a wonderful time! Thank you! Thank you Mr. Bradley for allowing me the privilege to use your space during my weekend stay at Myrtle Beach. The views and environment were spectacular from the 12th floor. The suite was perfect, exactly what we wanted. The view was amazing from our balcony and the amenities were great! And the location is perfect! Definitely would stay again! We loved our stay at Myrtle Beach! This condo has a beautiful view of the ocean and you are literally steps away from the beach. The unit was sufficient to sleep 4 comfortably. We had no trouble cooking all our meals in the condo which saved money. There are also a lot of great attractions nearby. The pool was almost never busy so we had no trouble finding a pool chair. The building itself could use some updating and some of the walls/patch work are a little rough. We could have used a remote for the DVD player and a cable channel guide for the TV. Overall, this condo is a great value. Holiday Rate may apply to certain dates. The rate is subject to change until reservation confirmation.